Much as it pains me to admit because I think the woman is the exact opposite of what is truly needed in a government official, I don’t think Sarah Palin really had much to do with the shooting in Tuscon this weekend. 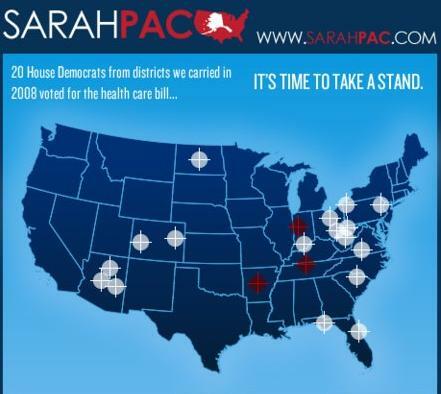 Even with the awful map that she promptly took down from her website. There’s nothing the news media loves more than a tragedy. It’s a time when anchorpeople can try out their “solemn voices” and they can interview people who went to elementary school with the cousin of a victim and pretend that they have anything to say other than what is obvious: when people die from the gunfire of a mentally unstable person, it’s awful. The worst part of the media coverage is all the speculation about “why?” and “how?”. It’s times like these that I want to start passing out Hume tracts. Let me sum up: According to Scottish philosopher and empiricist David Hume, there is no such thing as causation. It’s not real. We don’t experience it. There is only constant conjunction, and we human beings try to explain things by causation because it’s easier for us than to admit that there’s really no infallible way of understanding or predicting any of this. The alleged gunman (Jared Loughner, 22) in this weekend’s attack on Congresswoman Gabrielle Giffords was known for having bizarre, nonsensical outbursts in classes at his community college. He smoked marijuana and salvia. He was a stickler for grammar. He found skulls aesthetically pleasing. He liked conspiracy theories. He was known to be mentally unstable and possibly an undiagnosed schizophrenic. He had access to guns. The media likes to lump all of these things together as causes, playing into the stereotype that being a little morbid or skeptical of reality makes you a violent lunatic capable of murder. That he had access to guns I would say we can reasonably call a cause, even with the Humean stipulation, because any idiot will tell you that getting shot can kill you. That he was prone to crazy outbursts and threatened to kill people I think we can reasonably consider a warning sign, though having schizophrenia (or whatever label you want to stamp on him) does not necessarily entail violence. That he smoked marijuana has a lot less bearing on the matter, unless a) he was smoking something that was a bit more potent than marijuana, or b) that he had smoked enough marijuana in his short lifespan that he suffered severe brain damage. But the media doesn’t distinguish and stamps a big “cause” sign on all of these things. We’ll never know all the contributing factors. We can never really identify a true series of causes because we aren’t omniscient, but it worries me that we don’t even separate between reasonable conjunctions and completely contingent correlations. The fact that the obvious contributing factor – access to a 9mm semi-automatic pistol and extended clips – is being lumped with a fondness for conspiracy theories really troubles me. If we were truly interested in preventing things like this from happening, we’d at least be logical about this. Nearly 12 years ago Marilyn Manson’s name got unfairly lumped in with the Columbine High School massacre, when the fact that the highly constant conjunction that gunfire kills people is never dealt with in legislation. I can only conclude that lawmakers don’t actually want to prevent people, including children, from being shot to death. I don’t know how accurate that bit of speculation is, and I think perhaps the discourse of “mental illness” needs to be re-examined. That’s obviously rhetorical. We all know why.